Hi All sorry if this has been asked before but I could not find anything when searching. I am doing my head gasket and under the rocker cover there is a plastic cover. I was just wondering how is this attached as when i took the rocker cover off it just seems to be sat on top. Is this how it is supposed to be ? Ive been told i need it as it stops splash from the oil. How shagged is my timing belt? 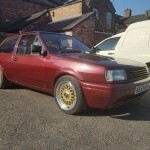 Hi there i have a 1992 mk2f polo 1.3 spi and i am wishing to get a little more power out of it so was thinking of doing a cam shaft upgrade. i was thinking of getting a 272 cam but thats it. Really i need help in what i should do or what else i need to get to make it work. my engine has only done 34k miles so dont really want to damage it. Thanks in advance. CAM Belt - what else to do at the same time? Was wondering what cams have been put into these engines (APQ) before? I'm just trying to squeeze a little more life into my 8v 6n. I'm just in process of fitting a pipercross viper enclosed induction kit & toying with the idea of a steel exhaust manifold. The engines due a cambelt change in a few thousand miles so thought it would be a good time to consider a new cam. I've looked at a 264 & a 268 deg which both sound reasonable from http://www.newman-cams.com/catalogue.html but wondering if these would even fit? Any suggestions people?? ?